It’s a great time to seriously consider solar panels for your home. We all know where fossil fuels are headed. Hopefully left as “fossils” and in the ground! The marketplace is demanding better and people want sustainable homes. 2017 is the final year to take advantage of Ontario’s microFIT program – an incentive that allows your system to pay for itself, virtually. There will never be another program like this in Ontario, so if you’ve been on the fence, the time is now. It’s good for the environment – it’s clean and renewable. It’s a smart home investment – it will increase the value of your home, in addition to the energy savings each month. 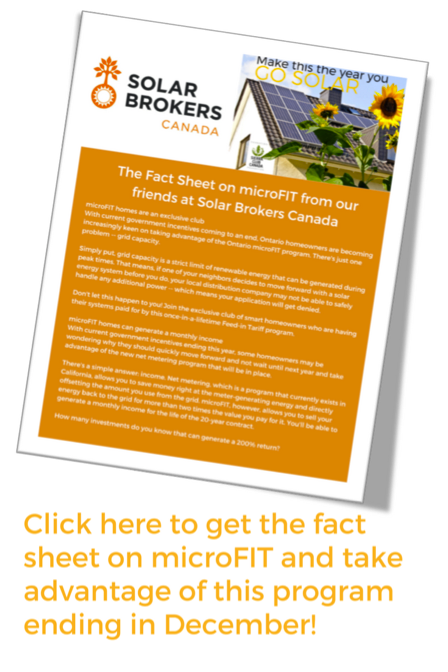 Our friends at Solar Brokers Canada will help with financing your home solar project. Reach out to them today and they will get you all the information you need to go solar this fall. Solar Brokers Canada have generously offered a $500 savings for you if you move forward with a home solar project. And named in your honour, they will also make a $500 donation to Sierra Club Canada Foundation. You help fund the important environmental work of Sierra Club Canada Foundation. Your home energy costs can be offset by up to 50%. You can feel great knowing your home is no longer kicking out large amounts of damaging carbon. AND you will be producing and sending clean energy back into the system, while generating yourself revenue! According to a recent survey by Eco Analytics, 94% of respondents believe there should be more emphasis placed on Solar, while roughly 50% think less emphasis should be put on Nuclear, Oil, and Coal. This shows that people want and are interested in solar, but don’t know how to go solar. According to a recent survey by Eco Analytics, around 80% of respondents believe people should be doing more to prevent climate change. Solar is an excellent way to lower your home’s carbon footprint while helping offset energy costs. Some studies have shown that for every $1 of annual energy savings, the value of your home increases by $15 to $20. As well, listings with the words “energy efficient” sold for 5.8% more than comparable homes without these upgrades. By 2018, the Ontario Climate Change Action Plan will require all homes – that are planning to enter the housing market – to undergo a home energy audit. Going solar, aside from being an appreciating asset, will directly help affect the marketability and value of your home. Go solar today by contacting our friends at Solar Brokers Canada. And be sure to tell them you are a committed supporter of Sierra Club Canada Foundation. They care about the health of our planet, just like you!